A year ago, Triple Nine emulated Dangdae Bulpae in winning the President’s Cup for the third consecutive year. Now the six-year-old has a chance to enter unchartered territory as he bids to take home the trophy an unprecedented 4th time. Having finished 2nd in the Korean Derby to Yeongcheon Ace and 2nd in the Minister’s Cup to Rock Band, Triple Nine beat both his fellow three-year-olds to more than make amends for missing out in the Triple Crown races. Under Lim Sung-sil, Triple Nine was sent out as slight faovurite and stalked the early leaders before unleashing in the home straight to score by three-lengths from Rock Band and outsider Ildeung Hanghaesa. Stablemate Power Blade had won all three legs of the Triple Crown but he was no match for Triple Nine, who two months earlier had also finished ahead of him in the inugural Korea Cup. The younger horse could get no closer than three-lengths on the line as Seo Seung-un steered Triple Nine to a comfortable win. Success Story, who had run well at the Dubai World Cup Carnival at the stand of the year came home in 3rd place. Two months later, both Triple Nine and Power Blade would themselves jet off for successful stints in Dubai. With Power Blade having recently finally started to get the better of his rival, most pundits were of the opinion that this time there would be a changing of the guard. Not a bit of it as with Lim Sung-sil up once more, Triple Nine collared Power Blade with a furlong to go, zipping by him as if he was wasn’t there to claim his hat-trick by two-legnths on the line. The board ended up identical to that od 2016 with Success Story once more in 3rd. Dangdae Bulpae won three consective President’s Cups between 2010 and 2012 but while he did attempt a fourth in 2013, it proved a race too far as he finished 10th of 16 as Indie Band took victory and was retired afterwards. Both Indie Band and Dangdae Bulpae are now retired at Isidore Farm on Jeju Island – the farm where Triple Nine was foaled. Dangdae Bulpae now has his own bronze statue at Busan Racecourse (although his greatest wins were at Seoul he, just like Triple Nine, was trained on the South Coast). Triple Nine’s statue is already assured. If he wins on Sunday, it may just be in Gold. Biwa Shinseiki, sire of three-time President’s Cup winner Dangdae Bulpae, has died aged 18. 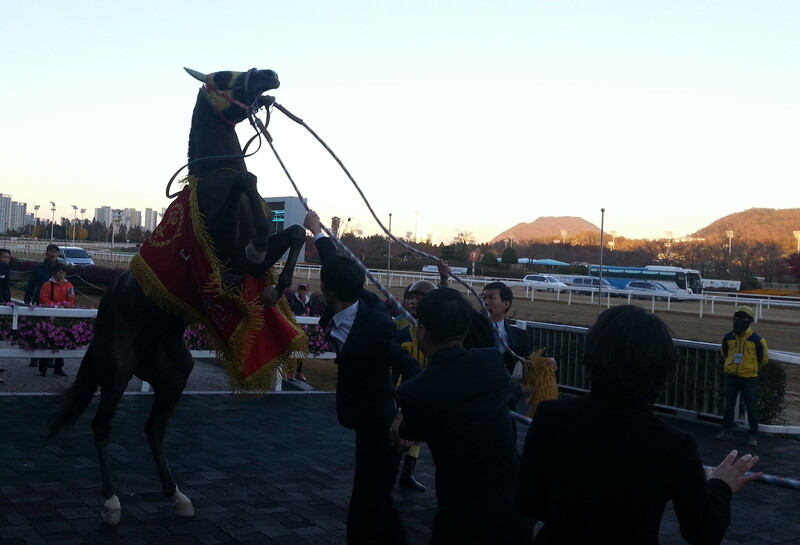 The Japanese-bred stallion was standing privately in Korea. Eagle Cafe, winner of the NHK Mile in 2000 and Japan Cup Dirt in 2002, also passed away on Jeju Island in September. Bred by Hayata Farms, Biwa Shinseiki [Forty Niner – Oceana (Northern Dancer)] was a very good racehorse in Japan landing 10 wins, 7 places and 8 shows from a total of 33 starts in a career lasting from 2001 until 2004. Those wins included two big Stakes races as well as five consecutive victories between May and December in 2002. That winning streak came to an end when he was 2nd in that year’s Tokyo Daishoten at Ohi, a race in which he would finish 3rd in 2003. Also in 2003, he was 2nd in the February Stakes, one of the few Grade 1 races in Japan to be run on dirt. Usually run over a mile at Tokyo Racecourse, in 2003 it was held at Nakayama over 1800M. Due to its dirt and its distance, the February Stakes is a popular race among Korean breeders with past winners Meisei Opera (1999), Admire Don (2004) and most recently Testa Matta (2012) all going on to stand at stud in Korea. Following a racing career in which he earned in excess of 370 Million Japanese Yen, Biwa Shinseiki was purchased by Korean interests in 2005 to stand at Pureun Farm. For a privately standing sire, he got plenty of mares but it was in his very first season at Stud, in 2006, when he covered the Alydeed mare Indeed My Dear. She had produced some very average racehorses beforehand but the resulting foal would become one of the best horses Korea has seen. Dangdae Bulpae would win 19 of his 32 races between 2009 and 2013. He was quite a late-developer as a three-year-old only managing 3rd in the 2010 Korean Derby but he won the final leg of the Triple Crown, the Minister’s Cup, in October and a month later returned to Seoul the following month to claim Korea’s joint-richest race, the President’s Cup, something he would go on to do for the following two years. Dangdae Bulpae’s exploits helped Biwa Shinseiki to 8th place on the Leading Sire list on 2010, to 10th in 2011 and 12th in 2012. None of his other foals would be anything like as good although he produced many winners even if few made it up to class 1 level. Biwa Shinseiki died on September 28. Cause of death is yet to be officially confirmed. 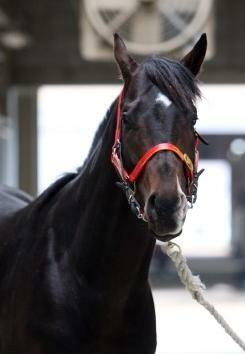 Also passing away in September was Nokwon Farm’s Eagle Cafe (Gulch), another horse who raced in Japan. He was the winner of just five races, however, they included the NHK Mile Cup at Tokyo in 2000 and then in 2002, the Japan Cup Dirt (now known as the Champion’s Cup) under Frankie Dettori. Eagle Cafe [Gulch – Net Dancer (Nureyev)] was bred in the US but trained in Japan. He also raced in Dubai and France. He came to Korea to stand at Nokwon – a farm with close Japanese ties – in 2011 but covered few mares and was to all intents and purposes retired in 2014. 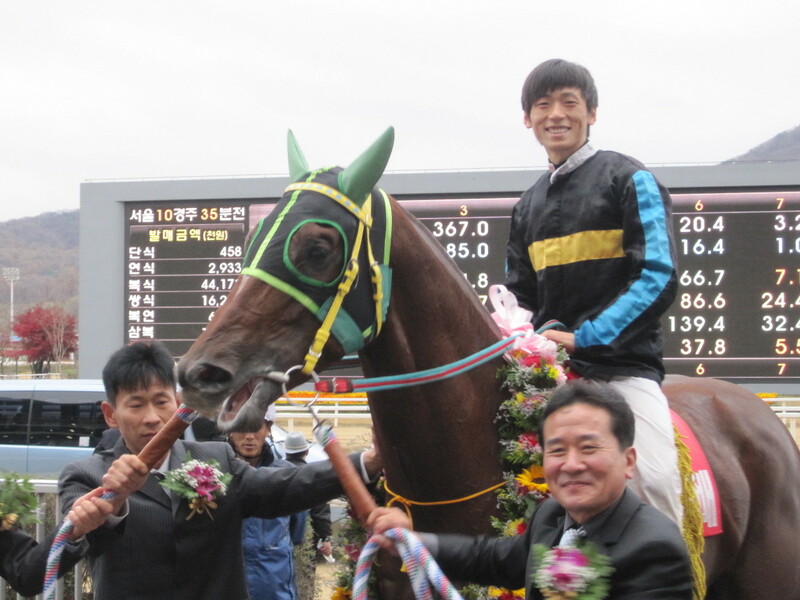 His gelding Honey Butter Nino is the first Korea-based horse in training for Japanese owner Shigeo Kadono. Eagle Cafe died from colic aged 19 on September 30. Dangdae Bulpae’s three-year reign as President’s Cup champion came to an end as Indie Band scored an emphatic victory in Korea’s richest race at Seoul Race Park this afternoon. Indie Band may have won the President’s Cup, but he was in no mood to pose for a win picture! 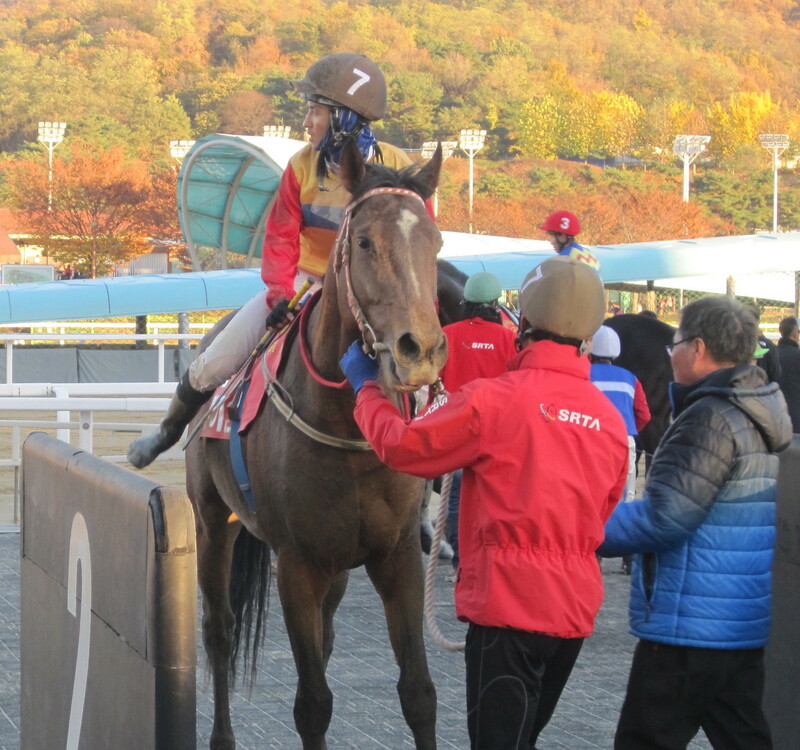 Jigeum I Sungan was sent off as the slight favourite ahead of the only once beaten Gwanggyo Bisang with punters doubting Dangdae Bulpae’s fitness as he sought his fourth consecutive victory in this race. In hindsight, those doubts seem well-founded. Although he showed at the front for the opening stages of the race, once the field turned for home, there was none of the familiar kick from Dangdae Bulpae that had so often before left his rivals trailing. He wasn’t alone. All six of the leaders entering the home straight faded with just over a furlong to go. 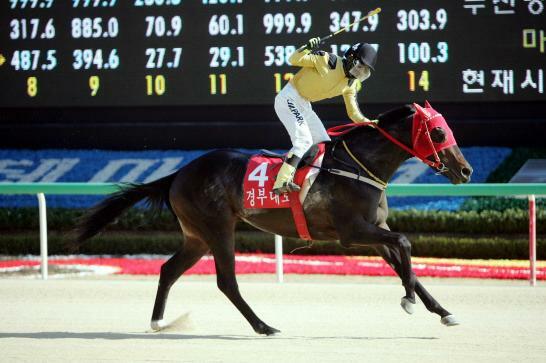 Among the closers, 2012 Derby-winner Jigeum I Sungan and Busan Owners’ Cup winner Gyeongbudaero made their moves first, but it was Indie Band whose sprint was the sharpest. Still with six horses ahead of him as they entered the final furlong, under the urging of jockey Lim Sung Sil, he sailed past them all, hitting the front in the final 50 metres and going clear for a two-length win. Of the foreign interests, Joe Fujii was 5th on Indie Band’s stablemate Road To Prince, one place in front of Ikuyasu Kurakane on Naejangsan. Masa Tanaka was 8th on Major King while there was disappointment for Darryll Holland who came home 15 of 16 on Peter Wolsley’s My Winner. With the victory, Indie Band moves on to 7 wins from 11 starts. 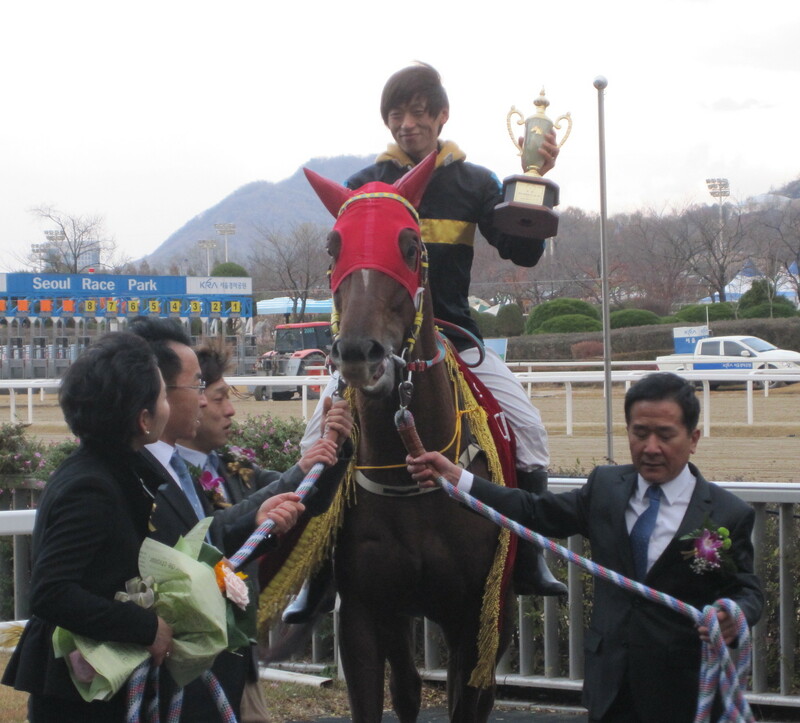 It was his 2nd Stakes victory, with the other coming in the Gyeongnam Do Min Ilbo Cup back in July. By all accounts he’s a dreadful worker in the mornings. Dangdae Bulpae was very much the same but it was Indie Band who brought his best to the track this afternoon. There’s another similarity with the former champion. The past few Stakes winners at Seoul; Jigeum I Sungan, Gwanggyo Bisang and Major King have all been so docile in the winner’s circle that punters have been allowed to pet them. Dangdae Bulpae never allowed that (although he was, for the most part well-behaved). Today, Indie Band threw a proper tantrum to the extent that the post ceremony photo session had to be called off. He’ll be back at Seoul for the Grand Prix Stakes in December. Last year’s winner Gamdonguibada was in winning action down at Busan today but on this form, Indie Band has to be in with a chance. Jigeum I Sungan should be given a run too although it is questionable whether Gyeongbudaero will get the distance. As for Dangdae Bulpae, he’ll almost certainly not run, nevertheless, the likes of Indie Band still have a very long way to go to match his achievements. Today was a good start though. 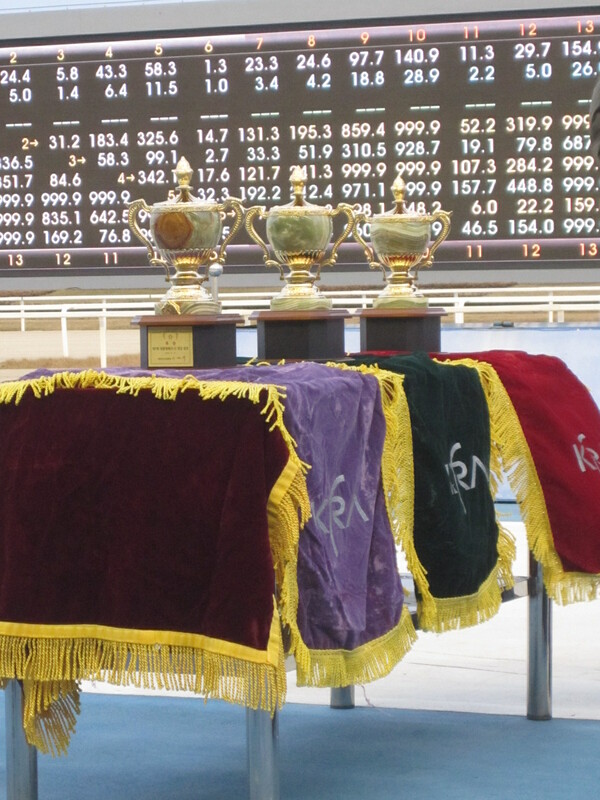 Next weekend the Stakes action moves to Busan with the Gyeongnam Governor’s Cup, the final leg of the Queens’ Tour to determine the nation’s champion filly or mare. Derby and Oaks winner Speedy First is set to go along with big name stars Secret Whisper and Joy Lucky. Look out for a full preview this coming Wednesday. Dangdae Bulpae has won a remarkable 3 consecutive President’s Cups. On Sunday he faces his toughest challenge yet as 15 rivals seek to prevent him recording a scarcely believable 4th straight victory in Korea’s richest horse race. Chief among those rivals is Jigeum I Sungan. 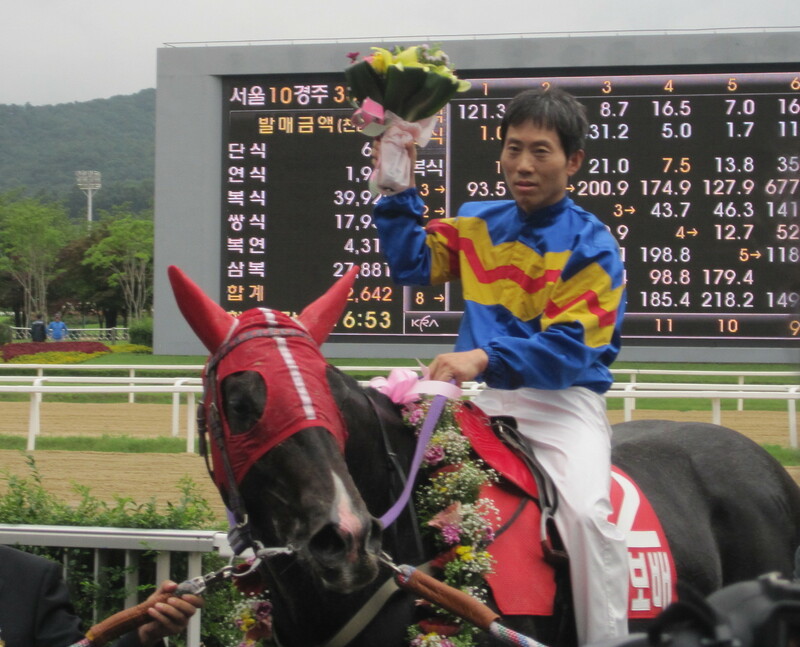 The 2012 Korea Derby and Minister’s Cup winner has just kept on getting better and better and at 2000 metres on his home track, he is set to be the toughest opponent that Dangdae Bulpae has ever faced in this race. They are joined by a host of other Stakes winners. This year’s Minister’s Cup winner Major King is up from Busan as is Gyeongnam DoMin Ilbo winner Indie Band and Owners’ Cup champion Gyeongbudaero. 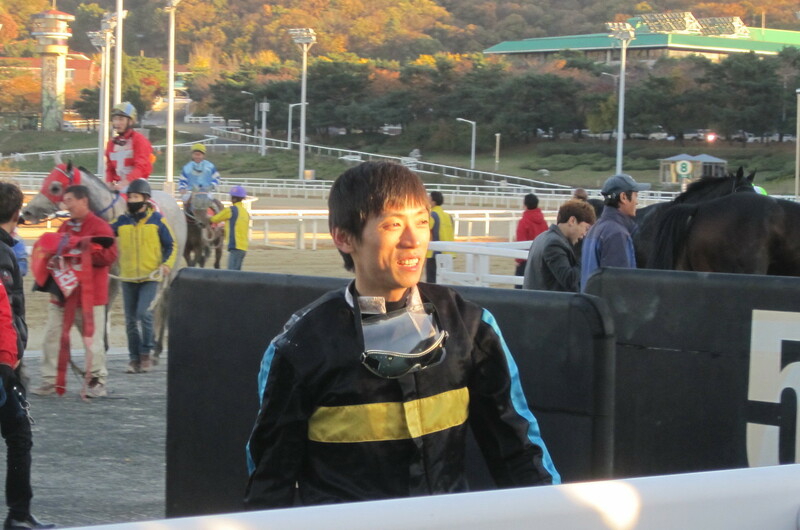 Meanwhile, in addition to Jigeum I Sungan, the host track sends out the up-and-comer Gwanggyo Bisang, who has won 7 of his 8 starts to date. The stark figure of 7 wins from 21 starts doesn’t really do justice to this horse, who has only finished outside the money once. Last time out he beat Dangdae Bulpae in the Owners’ Cup. An additional furlong and being at Seoul will not be to his advantage and he will need to be on his absolute best form – and others to be below theirs – for him to win this. You can never rule our trainer Kim Young Kwan and jockey Joe Fujii in a big Stakes race. However, while a consistent winner, Road To Prince has disappointed whenever he has faced the best and was back in 6th in the Owners’ Cup. He bounced back to win next time out but it’s enough to suggest he’ll not be favoured here. The wildcard. As a gelding, he was ineligible for the Classics this year but has won back-to-back Stakes races in his last two outings. He’s never faced a field like this one and he’s untried at 2000 metres but we’ll not fault him for that. Worth watching the board to see if there is any value. A winner last time out in a weak class 1 event, Geuma Champ should find himself a little overmatched here. Will like the distance but others will like it more. 3rd in the Derby in 2011, he has gone on to become a very consistent handicapper. He should be close here but it’s unlikely he’ll be challenging for the win. Without a run since February, the undoubtedly talented Naejangsan is an unknown here. Cannot be recommended although if he retains his best form from before his layoff, he’ll not be embarrassed either. Seoul’s champion. 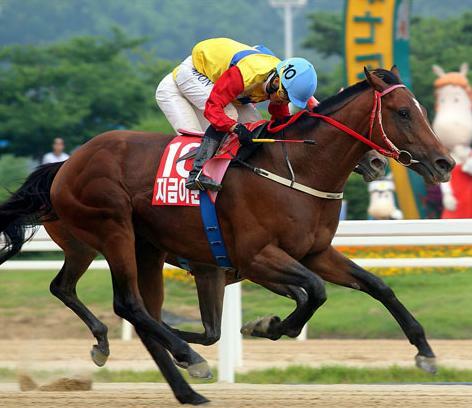 A Korean Derby and Multiple Stakes winner, Jigeum I Sungan is a real star. Made for the distance – if anything, he’d like to go further – he should be causing Dangdae Bulpae serious problems. A real chance and its difficult to make a case against his right to be the favourite. A faithful old handicapper who has never won at class 1 and won’t come anywhere close to winning here. A tough one to call – he could be brilliant but he could be very average. 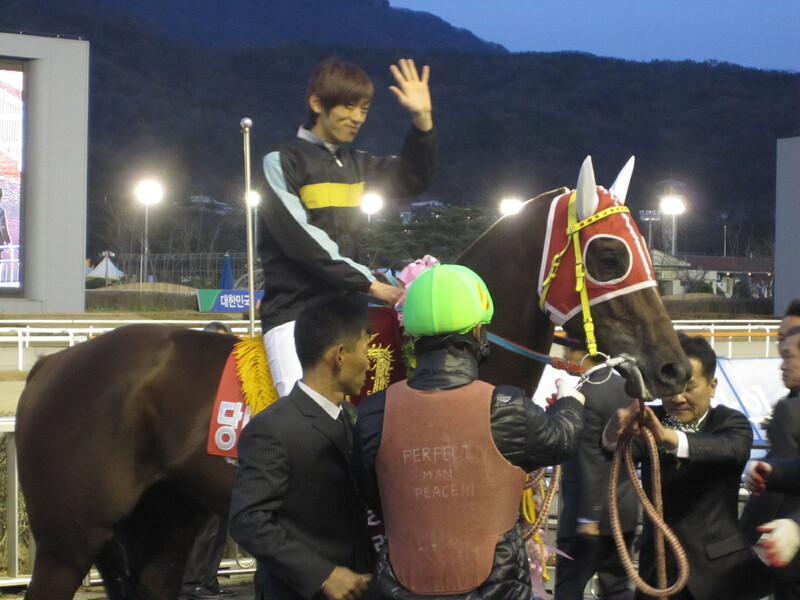 He won the Gyeongnam Do-Min Ilbo but could only manage 3rd to Major King in the Minister’s Cup. A very good chance of a place if he turns up in form and in a good mood. He was a good horse and is a Stakes winner. He’ll not be winning this. A slightly late developer, Gumanseok has recorded some very impressive results this year, including a Stakes win in the Sports Chosun Cup. He’ll need even more improvement to challenge here though. The Minister’s Cup winner, Major King is talented and clearly likes the Seoul course. Naturally, improvement is needed if he is to feature here – that Minister’s Cup field had nothing like the depth that there is here – but in his recent outings he’s come on each time and with some more progress, he could be challenging for at least a place. Only one win in the last two years doesn’t exactly set the heart racing and it’s unlikely that Super Rich will in contention at the business end of this race. He has won this race three times in a row and is arguably the greatest ever Korean-bred racehorse in history. A few little nagging injuries have been catching up on Dangdae Bulpae recently and he has been very conservatively campaigned this year. He generally does not lose at Seoul but he also doesn’t usually face Jigeum I Sungan. hIf he is 100% fit and on top form, he can beat him, however, he is more vulnerable than he has been at any time during his 3-year President’s Cup reign. A very consistent money winner but Special Win is no star and it’s hard to see him competing here. It could be a little bit too much too soon for My Winner, however, any horse trained by Peter Wolsley and ridden by Darryll Holland is sure to have been well-prepared and will give anyone a run for their money. An outside chance of a place. Gyongmaman’s verdict: Dangdae Bulpae winning this for the 4th consecutive time is to be hoped for but given the questions this year over both his form and fitness, the pragmatic punter will lean towards Jigeum I Sungan to win the President’s Cup. Dangdae Bulpae [Biwa Shinseiki – Indeed My Dear (Alydeed)] has won more Stakes races and more prize-money than any other Korean horse in history. This coming Sunday, fitness permitting, he comes back to Seoul Race Park to attempt to win the President’s Cup, the nation’s richest race, for the 4th consecutive time. It’s going to be his toughest challenge yet as he faces Jigeum I Sungan (Ingrandire), a Korean Derby winner 2 years his junior, for the very first time. This is going to be a good one. We’ll have plenty more build-up over the next few days. After spending the best part of a year and half finishing 2nd or 3rd to the great and good of Korean racing, Gyeongbudaero finally came out on top, producing a late burst to win the Owners’ Cup at Busan Race Park today. The 2012 KRA Cup Mile winner went on to finish 3rd in the Derby, 2nd in last year’s Owners’ Cup, 3rd in the Minister’s Cup and 3rd again in the President’s Cup. This year he finished 3rd in the Busan Ilbo before finally winning a handicap in April. He was 3rd in the betting today. Unsurprising, given that finishing 3rd is what he is best at. Dangdae Bulpae, the 3-time President’s Cup winner and victor in that Busan Ilbo, was sent off the heavy favourite, despite it being only his second run back from a long injury. With 2 furlongs to go, it looked like Dangdae Bulpae would win comfortably. Gyeongbudaero, after sitting in the middle of the field for most of race was steadily making ground but few expected him to go past – he doesn’t like winning, after all. 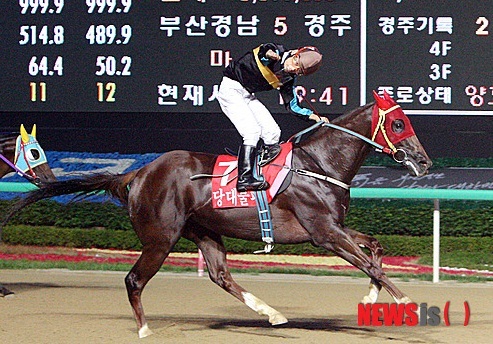 However, as the final furlong wore on, it became clear that Gyeongbudaero was going the quickest and he swept by Dangdae Bulpae to claim the prize by half a length. 15/1 chance Powerful Korea, who had led much of the way, stayed on for 3rd while mare Useung Touch turned in a typically solid effort in 4th ahead of filly Grand Teukgeup. The well-fancied Road To Prince found trouble in the home straight and, under Joe Fujii, could only manage 6th. Maybe Dangdae Bulpae has lost a yard of pace since his injury, however, after promising so much for so long, Gyeongbudaero is finally making good. He will be among the main favourites to stop Dangdae Bulpae at Seoul in November if the champion goes for his 4th President’s Cup.